Gov. Rochas Okorocha of Imo says there is no better man for the Presidency than Muhammadu Buhari. "President Buhari is the best for the country at the moment and there could not have been a better option now. "I am a believer of Buhari and I made it clear years ago that if President Buhari is running for president, I will not run. "Now God has chosen him to be the president of Nigeria and some of us are witnesses that Buhari was and is still the best for Nigeria at this material time," said the Governor of Imo State, Rochas Okorocha, who has been in the news for several statues erected in his state by his administration. 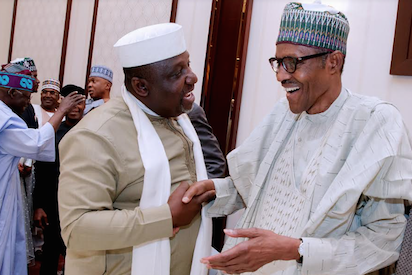 Governor Okorocha was addressing leaders of the ‘Democratic Youths Congress for Buhari 2019', who were on a courtesy visit to him at the Government House, Owerri on Tuesday. He urged every Nigerian to support President Buhari for second term, adding that all but two Governors in the country, regardless of party affiliation, were in support of a second term for the President. Okorocha also said that Nigeria's quick exit from economic recession was a testament to Buhari's tenacity. He says he has shelved his ambition in preference to support Buhari. While appealing to others to extend the same level of support, he expressed his belief that Buhari’s second term would bring about enhanced unity and peace of Nigeria. "Supporting Buhari for a second tenure will bring about the new Nigeria we are talking about. This will put Nigeria first and the unity we are looking for will be guaranteed under this administration. "Our nation is going through a challenging moment and we will require a man of his calibre to see us through this period. "People should not use the Anambra election result to judge the support for Buhari, as it does not reflect the support. "Even the government and people of Anambra support President Buhari. What happened was that an internal disagreement among the leaders in APC in Anambra cost us the election," he claimed. Earlier, the National Chairman of the group, Mr Kassim Kassim, said the group came to appeal to Okorocha to shelve his ambition of running for the office of the president in 2019. He noted that although Okorocha was well qualified to run, his support was needed to enable Buhari to complete his "good works for the nation". "With your track records, we would have gladly chosen you to run for 2019, but we have all endorsed Buhari and accepted that you lead us all the way in the support. "We are begging and pleading that you lead all the governors of APC to support Buhari for what he has done and what he stands for in Nigeria. "With you on our side, victory is assured," Kassim said.